Mine: Wonderful! Flawlessly done. watch this one over and over agina. Still makes me cry. Leonard Maltin/Plot synopsis: Enjoyable story-within-a-story film, in which repressed Southern wife Bates meets elderly Tandy at a nursing home and becomes captivated by her tale-spinning about two feisty female friends and their escapades in the 1920s and 30s. 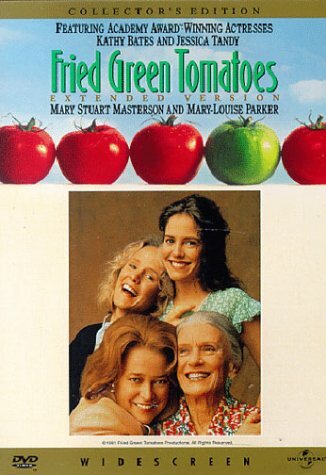 First-rate adaptation of Fannie Flagg's novel Fried Green Tomatoes at the Whistle Stop Cafe with just one problem: a couple of endings too many. Impressive feature directorial debut for producer Avnet. Flagg has an amusing cameo. (out of 5 stars) I absolutely love this movie. The acting and the look of it are both terrific and it;s a wonderful story. It's the kind of movie you can watch over and over again (and I do). There are a few minor things I would have changed about the plot, and I think the ending is a little lame, but the rest of the movie is so good that it makes up for these small flaws. My advice to anyone who liked this movie: READ THE BOOK!